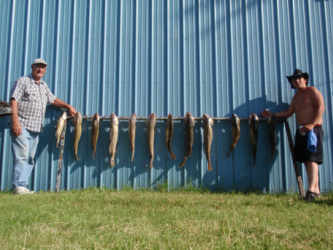 Originally from Economy , Pennsylvania I grew up fishing the 3 rivers for walleye , sauger , smallmouth , catfish , carp , and Musky . I explored the Erie Tributaries and all areas of Pennsylvania for stream trout , steelhead , and salmon . While living at home with my parents I was enabled to keep my place amongst the wilds of PA and explored all it had to offer when I was not working . The outdoors has been my playground through the grace of god and my loving parents who enabled me at a young age to be part of nature . I owe all that I have came to know within my lifetime to thier patience with my obsession . In 2002 I bought a home in Chicora , Pennsylvania where I'd spend countless hours exploring Lake Arthur , Allegheny River , Clarion River , Tionesta Creek and many tributaries to each of these bodies of waters . In 2009 I moved to Lake City , PA to establish my lifelong dream "A Day Away Fishing Adventures" to share knowledge with my fellow fisherman / women from what I've come to learn . I encourage everyone to come aboard with us as we will laugh , share commradere , and enjoy nature with all that is has to offer . I know that each day on the water leaves me with a satisfaction that is unsurpassed by anything else and from our family to yours I cannot wait to share with you . Please feel free to contact me stephens.donald@rocketmail.com if the listed trips do not suite your needs and you need a custom trip we will make every effort to accommodate your needs . If you have any comments or questions please do not hesitate to contact us as we strive to give you 110% on every endeavor together . 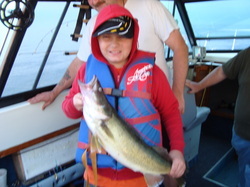 Be it a meat run for perch or walleye , fishing for steelhead , instruction for someone new to the sport , a child's introduction to fishing , brushing up on perfecting your skills , or just a day away . I will be you're Charter Captain in both Ohio / PA waters . 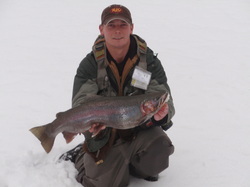 I guide all PA tributaries for fly / spin fishing while outsource Ohio tributary fishing to other guides should you choose to fish an Ohio Tributary . We look forward to your smile .